Herein, authors should choose among the topics in the new submission form, one of the proposed special sessions. Our focus is on knowledge representation and how to enhance human-machine interaction. As remarked in the last challenge stated by the USA Defense Advanced Research Projects Agency (DARPA), “even though current AI systems offer many benefits in many applications, their effectiveness is limited by a lack of explanation ability when interacting with humans”. Accordingly, non-expert users, i.e., users without a strong background on AI, require a new generation of explainable AI systems. They are expected to naturally interact with humans, thus providing comprehensible explanations of decisions automatically made. The goal of this special session is to discuss and disseminate the most recent advancements focused on explainable artificial intelligence. The session goes a step ahead with respect to the previous events we organized (which were mainly focused on interpretable fuzzy systems) in some other conferences: joint IFSA-EUSFLAT 2009, ISDA 2009, WCCI 2010, WILF 2011, ESTYLF 2012, WCCI 2012, EUSFLAT 2013, IFSA-EUSFLAT2015, and FUZZ-IEEE2017. In many practical problems one needs to process information which is affected by some type of uncertainty. In order to take a working decision in such problems is very common to carry out two types of actions: aggregation of input data and similarity measurement between objects under study. In the aforesaid aggregation processes the pieces of information are symbolized via some numerical values and the fusion of the data is made by means of the so-called aggregation functions. Nowadays the study of such functions became a research field in the fuzzy framework. The interest and the work in this field is rapidly growing and have led to a deep study of not only classical aggregation functions such as weighted means, t-norms or t-conorms, but also of others such as those constructed by means of Choquet or Sugeno integrals, copulas, overlap and grouping functions or ignorance functions, among many others, as well as of generalizations of the notion of aggregation function, as it is the case of pre-aggregation functions. When the measurement of similarity between objects, that play a central role in the problem under consideration, must carried out in such a way that there is a limitation on the accuracy of the performed measurement (such as the intrinsic error of the apparatus used to measure) or a certain degree of similarity can be only determined between the objects being compared, fuzzy metrics and indistinguishability operators become of great importance and a natural tool. The numerical values provided by the both aforesaid types of similarities are interpreted as the degree of nearness between objects. In the particular case of fuzzy metrics such a degree is relative to a positive real parameter. In the last years, due to its versatility, the theory of fuzzy metrics and indistinguishability operators have been studied in depth providing a breakthrough in the theoretical context and a large number of papers which grows rapidly. All these developments in both frameworks have been closely linked to an increasing number of applications to many different topics, image processing, machine learning, decision making, pattern recognition, fuzzy control, social sciences and robotics, just to mention a few of them. Motivated by the interest aroused in the scientific community by the exposed topics, the purpose of this special session is to bring researchers in the field of Aggregation Functions, Fuzzy Metrics, Indistinguishability Operators and its Applications, to exchange their ideas and approaches, to discuss and to present latest results on this field, both from a theoretical and an applied point of view. 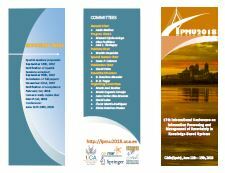 In this way, it will follow the rich tradition of Special Sessions in Aggregation Functions from previous IPMU Conferences, some of them co-organized by Tomasa Calvo, Humberto Bustince and Pilar Fuster. During the past few years Belief function theory, also known as Dempster-Shafer theory or Evidence theory, has attracted considerable attention within the Artificial Intelligence community as a promising method of dealing with uncertainty in expert systems. As presented in the literature, the Dempster-Shafer theory offers an alternative to traditional probabilistic theory for the mathematical representation of uncertainty. The significant innovation of this framework is that is allows for the allocation of a probability mass to sets or intervals. Dempster-Shafer theory does not require an assumption regarding the probability of the individual constituents of the set or interval. This is a potentially valuable tool for the evaluation of risk and reliability in engineering applications when it is not possible to obtain a precise measurement from experiments, or when knowledge is obtained from expert elicitation. An important aspect of this theory is the combination of evidence obtained from multiple sources and modeling of conflict between them. Applications in artificial intelligence, pattern recognition, classification, data fusion. Today, there is a great interest on the research of time series since they are used in many situations in real life. Researchers are very interested in extracting the relevant information from data that can be modelled as time series. Initially, time series are represented as raw data, and usually, they are computed using mathematical methods to obtain information from them while other approaches develop models to represent series. When time series has been modelled, different techniques can be used to find patterns and/or to study trends in such series. Finally, another relevant line of research concerns the description of the series using natural language where researchers aims to extract information expressed in natural language. For all these reasons, the goal of this special session is to provide an international forum for the presentation of recent results in the research of this field. Decision making is an inherent activity to mankind that can be seen as a process composed of different phases such as information gathering, analysis and selection based on different mental and reasoning processes that led to choose a suitable alternative among a set of possible alternatives in a given situation. Nowadays human beings daily face situations that rapidly change decision environments increasing its complexity. Moreover, Decision making is a core area in a wide range of disciplines such as Psychology, Economics, Political Sciences, Social Choice, Operations Research, Medicine, Artificial Intelligence, Engineering, etc. Because of this variety of disciplines, this special session aims at providing an opportunity for researchers working this research area to discuss in fundamental, approaches, methodologies, software systems, and applications, to share their novel ideas, original research results and practical experiences. Formal Concept Analysis (FCA) is being recently adopted as a solid alternative to the process of information treatment to be used in real applications with some automated methods. More specifically, it has been appreciated with a significant growth of their use in a wide variety of areas: Biomedicine, Tourism, Education, Social Networks, etc. A great part of this recent interest is due to its unique and general framework which allows to develop from the beginning to the end all the stages involved in the way from information to knowledge and, moreover, to automatically reason about it. During the past years, the research on extending FCA theory to cope with imprecise and incomplete information made significant progress: Fuzzy Formal Concept Analysis, FCA with granular computing, interval-valued, possibility theory, triadic and more intend to handle the uncertainty and vagueness in data. In recent years, fuzzy implication functions have become one of the main research lines of the fuzzy logic community. These logical connectives are the generalization of the classical two-valued implication to the infinite-valued setting. In addition to modelling fuzzy conditionals, they are also used to perform backward and forward inferences in different fuzzy rule based systems. Moreover, they have proved to be useful not only in fuzzy control and approximate reasoning, but also in many other fields like Multi-Valued Logic, Image Processing, Data Mining, Computing with Words and Rough Sets, among others. Due to this great variety of applications, fuzzy implication functions have attracted the efforts of many researchers also from the theoretical perspective focusing on problems whose solutions provide important insights from the point of view of their applications. Therefore, this special session seeks to bring together researchers interested in recent advances in the theory of fuzzy implication functions, concerning, among others, characterizations, representations, generalizations and their relationships with fuzzy negations, triangular norms, uninorms and other fuzzy logic connectives. This is a special event to honor Miguel Delgado. Fuzzy logic is a theory and a technique frequently used in the development of Artificial Intelligence systems. The aim of this special session is to serve as a meeting point and open discussion forum for researchers and practitioners on the latest developments on Fuzzy Logic theory and methodologies as a tool that can be applied in Artificial Intelligence Problems, focusing on problems challenges our societies have to face, and to offer an opportunity for researchers to identify new and promising research directions. We will welcome both theoretical and more application oriented contributions addressing: (a) Analysis about Artificial Intelligence problems where the use of Fuzzy Logic allows to obtain better problem models or solutions, (b) proposals of Fuzzy Logic based applications for solving real life problems, and (c) theoretical advances related to Fuzzy Logic models and concepts directed towards a better understanding or analysis of some AI problems. Challenges for Fuzzy Logic Applications. Fuzzy Mathematical Analysis is a research area in constant evolution. There are many articles on optimality conditions for fuzzy problems which are a proof of the great interest that this topic arouses among researchers. The classical analysis methods do not work in the fuzzy setting. It is well-known that in classical optimization convexity plays a central role in order to get sufficient conditions to characterize the solutions. Nevertheless in the fuzzy context, it has been demonstrated that such results do not remain valid. The objective of the special session is to provide a forum for the discussion of recent advances in the application of Data Mining and Knowledge Discovery technologies to diverse problems, focusing on those involving fuzzy methods, and to offer an opportunity for researchers to identify new and promising research directions. Data Mining aims at the automatic discovery of underlying non-trivial knowledge from datasets by applying intelligent analysis techniques. The interest in this research area has experienced a considerable growth in the last years due to two key factors: (a) knowledge hidden in organizations’ databases can be exploited to improve strategic and managerial decision- making in the current ultra-competitive markets; (b) the large volume of data managed by organizations makes it impossible to carry out an analysis process manually. Nowadays, the volume of information digitally stored has considerably increased not only in database format but also in text format which is available in open source bases such as the Web, including log files registering the use of the information or social media content. This has contributed to increase the interest on Text and Web Mining techniques. In one hand, these techniques aim to automatize the analysis process by introducing a variety of intelligent techniques to learn, optimize and represent uncertain and imprecise knowledge. On the other hand, these tools offer the possibility to analyze massive data offering more efficient algorithms and a suitable selection of obtained results in terms of their novelty, usefulness and interpretability. Applications of Data Mining techniques: health, tourism, biological process, customer profiles, anomaly detection, emergency management, situation recognition, etc. Fuzzy (F)-transforms successfully link various transforms (Fourier, Laplace, integral, Wavelet, etc.) with fuzzy approximation models. The general idea is to bring an original model into a special space where succeeding computations are easier. In particular, the F-transform transforms an infinitary object (a real function) into a finitary one (a finite vector). Another specific feature of the F-transform consists in including a fuzzy partition in its formal representation. In the recent ten years, the theory of F-transform became an important constituent in the field of computational intelligence. It has a well justified theory and many sophisticated applications in image, signal and time series processing. Moreover, it can be successfully used in numerical methods for differential and integro-differential equations including the case when uncertainty is included in their formulation. The exceptional feature of the F-transform is that it successively and efficiently copes with classical problems as well as with problems that are affected by uncertainty or vagueness. In image and signal processing, the F-transform effectively solves problems connected with up- (down-) scaling, reconstruction, edge detection, fusion, registration, etc. In time series analysis, the F-transform is used for trend extraction. In big data area, it works as a successful method of pattern recognition. The F-transform propagates usefulness and effectiveness of fuzzy methods on all levels of data processing. The aim of this special session is to present recent developments and trends in the theory and applications of the F-transform, including all mentioned above. Beside theoretical aspects, the session will be focused on advanced applications in data analysis including handling big data. This session is devoted to Imprecise Probability Theory. This theory encompasses all the mathematical models that can be used as more flexible tools than usual Probability Theory when the available information is scarce, vague or incomplete. It includes lower previsions, n- monotone capacities, belief functions and possibility measures, among others. We would like to attract papers that discuss and solve foundational questions, or clearly demonstrate the usefulness of imprecise probabilistic models in an application. We would particularly welcome papers going from theoretical advances to the solution of an associated applied problem. Note also that Imprecise Probability Theory is connected to other topics within the scope of IPMU, such as Dempster-Shafer Evidence Theory, Fuzzy Measures and their connections to Game Theory. Papers in these topics emphasizing the role of Imprecise Probabilities are also welcome. Internet is an extremely huge source of data containing knowledge on many levels. The highest level is apparent: what the data just say directly (e.g., height, age, sizes, etc.). There are, however, deep hidden layers containing knowledge far from being apparent. It is a big challenge to develop methods enabling us to gain it. Since knowledge can be characterized as familiarity, awareness, or understanding to facts, information, descriptions, or skills, we argue that logic has potential to formalize and represent the knowledge and to suggest methods how it can be obtained from the data. The prototypical example is the first data-mining method GUHA (established in 1968 by P. Hájek) that is an effective and ingenious combination of logic and probability. But there are other methods based on logic, e.g., fuzzy quantifiers, fuzzy/linguistic IF-THEN rules, association rules, concept lattices, and others. The theory of generalized quantifiers and their special cases (e.g., fuzzy or intermediate ones). Mining knowledge in the form of special rules (e.g., association or fuzzy/linguistic ones). Mining knowledge from time series. Case studies in mining knowledge from various kinds of data. Uncertainty is omnipresent in Brain Computer Interface applications, from capture of the brain signals to their interpretation and to modeling of their underlying causes. This session on BCI seeks to bring together research in BCI highlighting the need to capture uncertainty – probabilistic and fuzzy – in applications of BCI to robotics, thought controlled communication and movement support, virtual reality,and medicine. Energy consumption is one of the principal indicators of progress and welfare in a society, and thus, there is great concern regarding its different stages of development. World energy is currently fundamentally sustained by crude oil and its derivatives. In the wake of many years of price increases and due to the importance of that it has in the manufacturing industry and transportation, nations and researchers haver been pushed to think about creating alternative energy sources. The aim of this proposal is to show recent and novel applications of Management of Uncertainty in the field of Energy, especially Renewable Energy. To be precise, to different technological environments within these fields and showing the technical superiority of the solutions provided. Renewable energy resources: solar, wind, geothermal, biomass, biogas, biofuels, hydropower, hydrogen and ocean (wave, tidal…). Applications and services of renewable energy in rural areas, isolated areas, buildings, industry, electricity and transport. Others: Smart Cities, Life Cycle Assessment (LCA). Mathematical morphology, in its deterministic view, defines operators on lattices, which are, in turn, the cornerstone in various domains of knowledge representation and information or data processing. Mathematical morphology has been applied successfully for more than 50 years in image processing and image understanding, and the developed operations can also be poweful in all these other domains. Accordingly, mathematical morphology is becoming a suitable theory for data processing beyond image processing. This session aims at presenting advances on mathematical morphology on different types of data representations, including structures such as knowledge bases, graph or spatial databases, on imprecise data (e.g. represented as fuzzy sets, rough sets, fuzzy graphs, fuzzy logics, etc.). Links between mathematical morphology and other approaches in computer science are also considered in this session (e.g. concept lattices, rough sets, fuzzy transforms, etc). This special session is devoted to the most recent developments in the realm of fuzzy logic from a mathematical point of views, with particular emphasis on theoretical advances related to many-valued logics, algebraic semantics, combinatorial aspects, topological and categorical methods, proof theory and game theory, many-valued computation. In the framework of fuzzy sets and their extensions, many different measures of comparison have been suggested in the literature. Some of them are based on the degree of equality as, for example, the similarities. Analogously, some of them are based on the degree of difference between two sets, like distances, dissimilarities and divergences. These measures is very important, mainly for applications. In particular, they can be used to measure the degree of imprecision of a set, that is, to measure the entropy of this set. The study of these measures of comparison and the measures of fuzziness or imprecision are the main topics of this special session. In this special session, we look for innovative papers dealing with the use of computational intelligence techniques for the resolution of complex problems. Some techniques of interest are machine learning, evolutionary computation, and other metaheuristics to solve complex (discrete, continuous, or multi-objective) problems from different domains as telecommunications, engineering, bioinformatics, logistics, or scheduling, just to name a few. Data aggregation is a field currently experiencing a boost of attention. From new theoretical developments to an expansion of the application field and passing by the development of algorithms for effectively aggregating huge amounts of data, we aim at providing a forum for discussing the most updated research in the field. This special session offers a comprehensive, practice-oriented introduction to the field of fuzzy analytics. It includes an introduction to the basic concepts, together with extensive information about computational intelligence models and techniques that have been used to date. Here, a special emphasis is given to fuzzy optimization models. It covers different fields including transportation, logistics, supply chain management, data mininig and, more in general, decision-making problems. It represents a valuable resource for researchers, data scientists and practitioners in the fields of computational intelligence and analytics. This session will focus on recent developments in the field of fusion functions when generalized forms of monotonicity are considered, both from a theoretical and from an applied point of view. In this sense, the session aims at providing researchers in the field with an opportunity to present their most recent developments and for discussing recent trends in this area, as well as to identify potential problems of interest for researchers. In particular, this session will consider generalizations of the notion of aggregation functions, as pre-aggregation functions, which have appeared in the literature in recent years and which lead to new classes of functions that encompass both classical aggregation functions and other functions which are relevant, specially from the point of view of the applications, but which do not fulfil all the conditions required to an aggregation. Finally, applications which make use of these extensions are also welcomed. Applications of pre-aggregation functions in image processing. Transportation problem (TP) is the most important and particular type network- structured linear programming problem which provides us to control the optimum shipping patterns between the origin and the destinations. Most of the real world problems cannot be modeled with real (crisp) data and single objective function. Researchers have developed many efficient algorithms for tackling the multi-objective transportation problem (MOTP) where the parameters are uncertain (fuzzy, rough, random and their hybridization etc.) environment in the recent years. Game theory considers the mathematical solutions of conflict situations. Again a single criterion is not sufficient to design the real-life practical problems in game theory. Researchers have designed the game problems with the aid of multi-criteria decision making (MCDM) and uncertain environment in recent years. This special session invites to put together a large number of researchers concerning on transportation problem and game problem in uncertain data in multi-objective decision making (MODM)/MCDM in recent developments. For centuries the concept and properties of similarity has been the subject of study and a vehicle for establishing and describing the existing relations between objects. Beginning with Plato who considered it in the form of “analogy”, the notion of similarity manifested itself throughout the develop- ment of philosophical investigations regarding reasoning. Nowadays it plays an ever-increasing role in describing and understanding reasoning and cognition. Similarity that binds entities in an approximate, imprecise way is in the core of soft and granular methods of computing. There are studies on numerous approaches to modelling, expressing and utilizing similarity relations within the widely understood area of soft computing. In rough sets, modelling similarity is essential for both standard approaches and extensions concerning the analysis of complex data. Analogously, fuzzy systems strongly relate to modeling of similarities as well. Numerous applications of rough and fuzzy sets in the fields of information processing, decision support, recommendation and others tes- tify to the importance and usefulness of similarity-based tools. In the proposed special session, we intend to bring together researchers whose work corresponds to similarity modelling and handling, in particular with a use of rough and fuzzy approaches. The overall goal is to collect and review various methods for modelling similarity and scenarios of their applications. 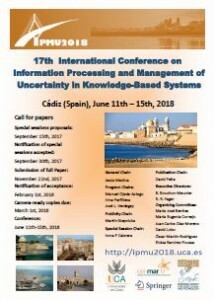 This special session aims to bring together researchers, engineers and practitioners to present the latest achievements and innovations in the field of Decision making in Uncertainty based on the theoretical foundation of soft computing, which can help (a) to decrease the level of input information uncertainty, (b) to improve the quality of decision-making processes by introduction new and modified fuzzy/neuro information processing algorithms and methods of structural- parametric optimization, (c) to discuss the main peculiarities of decision making systems’ applications taking into account specific uncertain data in different fields, and (d) to consider potential future directions in the area of Soft Computing for Decision Making in Uncertainty. Information Retrieval Systems. One of these trendiest topics may be Sentiment Analysis. Sentiment Analysis, also called Opinion Mining, studies the extraction of opinions or sentiments using mainly Information Retrieval, Natural Language Processing and Artificial Intelligence, especially due to the fact that the information treated is heterogeneous in nature and lack in precision and completeness. Traditional systems are incompetent to handle these data, for that reason, it is also necessary to use advance techniques like proposed by Soft Computing. Soft Computing refers to a family of several techniques (Fuzzy Logic, Neuro-computing, Probabilistic Reasoning, Evolutionary Computation, etc.) able to cope with lots of complex real-world problems. Therefore, this special session on “Soft Computing in Information Retrieval and Sentiment Analysis” provides a forum to the scientists, researchers, students and private sector parties to show original research works and real applications mainly related to possible uses of Soft Computing techniques for extracting, inferring, modeling, representing and handling information from heterogeneous sources like Internet. Tri-partition is here intended as an umbrella name to represent all those situations where we can differentiate among three different scenarios such as decisions or division in three parts of the universe under investigation. Under this name, we can find rough sets and three-way decision theory, two tools to deal with decision making problems in presence of unavailable information or incomplete data. Other examples of tri-partition based tools are interval sets, shadowed sets, orthopairs and the hexagon of oppositions whose emphasis is more on knowledge representation and abstraction. This special session collects papers discussing theories and applications in knowledge representation and decision- making under uncertainty with tri-partition related paradigms. Uncertainty is a serious problem in everyday medical practice and it is observed and described in medical literature. There are many meanings and types of imprecision in medicine with each of them having a different effect on the diagnosis or treatment. The imprecision types may be divided into objective (caused by the complexity or nature of the phenomenon) or subjective (caused by a personal opinion or doctor’s interpretation) or caused by the low quality of the information, e.g. due to incompleteness of the data. Through the use of soft computing methods, it is possible to construct models that, when uncertainty is taken into account properly, increase the effectiveness of medical decision making. The session aims at exchanging the experiences of scientists struggling with uncertainty in medicine and discussing possible future developments in this area. Fuzzy logic provides powerful tools in computer vision and video/image processing applications, where some data or results are uncertain due to inherent ambiguity and vagueness of video/image data. This uncertainty principle is one of the fundamental results in signal processing. Due to the recently increasing interest in using fuzzy set theory combined with computer vision techniques to create intelligent systems, this special session is designed to serve researchers and developers to publish their original, innovative and state-of-the-art works in these topics. This special session is aimed to cover a wide range of works and projects on computer vision, image processing, biometrics, neural networks, intelligent systems or related areas where the uncertainty is managed, providing a platform for academics and industry related researchers to discuss and share experiences. We hope that this session can provide a common forum to exchange ideas and the latest discoveries in the area. This session aims to bring together researchers interested in exploring the sources and treatment of uncertainty in intelligent image processing and understanding. Contributions using probabilistic models, evidential reasoning, and fuzzy models in all areas of image understanding are welcome. Models may be related to the images or to the knowledge used to interpret them. It is expected that this session will focus on higher level image interpretation beyond low level image processing.